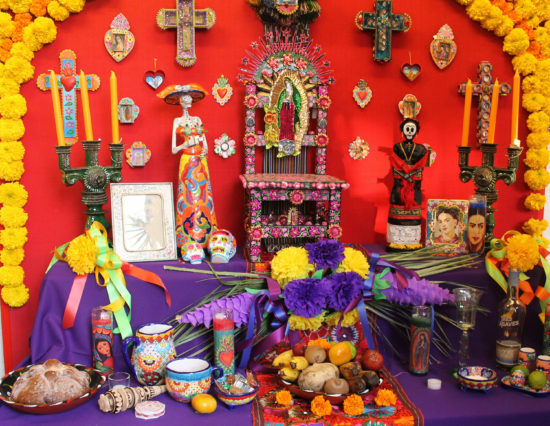 Old Town San Diego’s beloved Bazaar del Mundo Shops will pay homage to the dead with a Día de los Muertos event featuring elaborately decorated altars, sugar-skull decorating and face painting on Saturday, October 29. As part of Old Town San Diego’s annual Day of the Dead celebration, Bazaar del Mundo will transform its shops into a walkable trail of altars, complete with traditional sugar skulls, handmade papier-mâché decorations and special Day of the Dead-inspired clothing and crafts. Guest artists, including Lacey Waddell, Annette Fussell and Asia Bur-Min, will sell jewelry, accessories, books, clothing, candles, prints and cards, and other crafts promoting the holiday. Music will be performed by Latin American folk band Tinku. The event will take place from 10 a.m. to 8 p.m. at Bazaar del Mundo, located at the north entrance to Old Town, on the corner of Juan and Taylor Streets. The celebration will continue on Wednesday, November 2, in conjunction with Old Town’s Día de Los Muertos event, which includes the “Tour of Altars” at more than 40 altars throughout Old Town, a candlelight procession, face painting and mask decorating throughout Old Town at participating sites. Bazaar del Mundo will have its own face painter, and will transform its courtyard into a marketplace of vibrant Día de los Muertos merchandise, with treats and crafts for the family. Parking tips: park for free across the street at Caltrans all day or take the trolley.